Even though we are building a custom home, which tends to be more costly, we have deliberately made many decisions that aid in cutting expenses to stay within our budget. 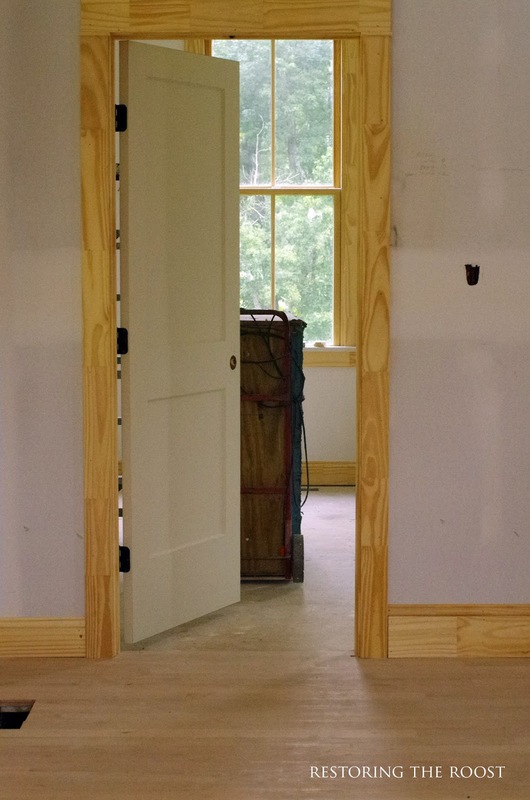 In other words, yes, you CAN build a custom, high quality home on a reasonable budget! (especially if you have a great builder who will work with you and give advice to keep costs down). One of the most important ways we stayed within budget was allowing most of the things we wanted within reason but also compromising on quite a few things too. I learned to be very flexible and to be content knowing that not everything on our wish list was going to be feasible for us to do. The items we splurged on were windows, the front door, countertops, tile for our master and guest bath, and the height of the ceilings. 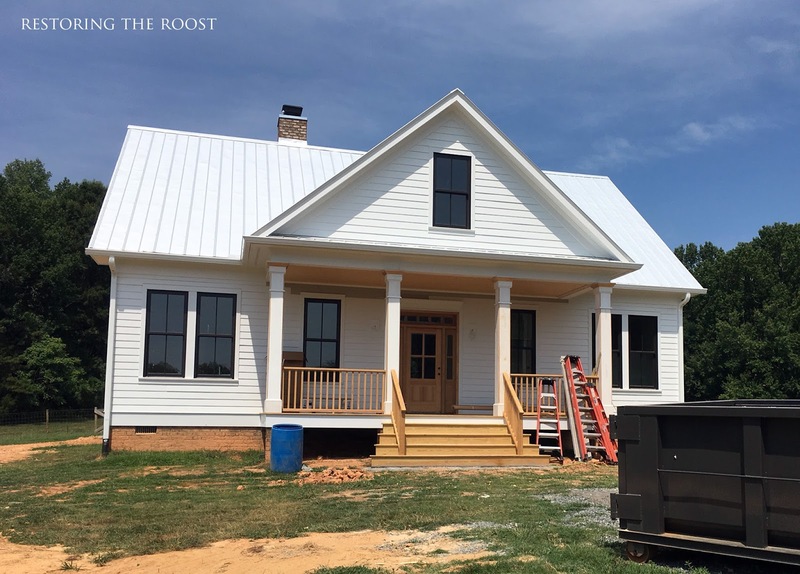 It seems like many aspects of the new house that are standard for our builders are pretty high-end, but it turns out that's just how our builders roll. For example, custom wood closet shelving systems at no extra cost? Built-in cabinetry in laundry room? Yes, please!! Interestingly, our cabinets for the kitchen and bath vanities are custom-made by our builders who are master carpenters and do all their own cabinetry work, and they were no more expensive than any other basic cabinets (even ikea!) that we could have bought elsewhere. -budget-friendly (but still high quality) flooring choices: basic oak for hardwood downstairs, carpet in bedrooms, tile in some bathrooms, vinyl plank in girls' bath, vinyl plank in laundry room. Of course there are a lot of building material costs that are difficult to cut down and the only way to really save is by cutting square footage. 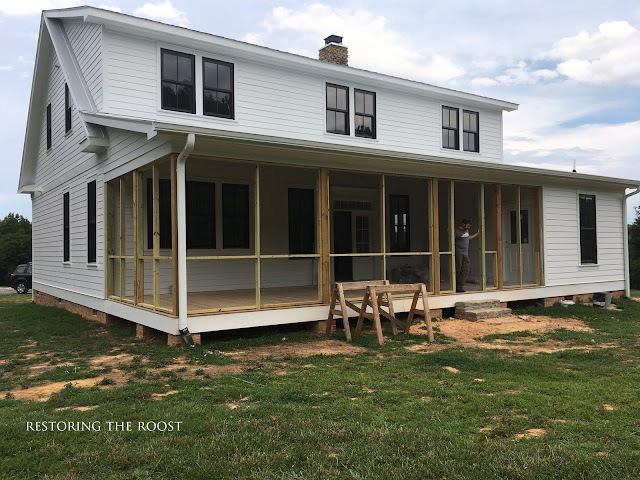 Still, we were able to make quite a dent in the cost of our house by choosing our house plan wisely and being conservative on high-end finishes or treatments. Additionally, since we were going for a simple farmhouse look, this lends itself to simple, cost-effective finishes anyway (think beadboard, subway tile, simple cabinets and trim, etc.). Wow...this has been tough. Who knew there are SO many different shades of whites to choose from even just from one brand of paint! 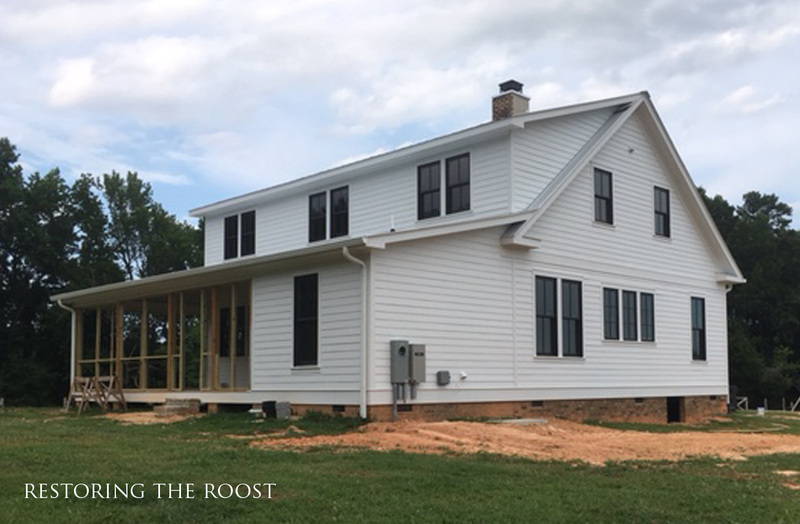 We are painting the exterior of our new home (under construction) as well as a good portion of the interior white and selecting the perfect shade of white has been a daunting task. Will it be too off-white? Too cool or stark? Too grey? I decided the best way for me to determine the white that we needed and liked was to look at lots of pictures of the color I was wanting to use in context (and in different lights). I also plan to simply test out the paint on whatever surface we are intending to paint. Fairly early on we decided to go with Sherwin Williams paints (as advised by our builder) so that we could still have high quality paint but not go too over budget. This automatically limited our color choices (which was a good thing) but there are many other great brands of paint out there for those that have time to sift through all those thousands of choices :) There were so many beautiful whites and soft neutral colors to choose from that I gathered several samples together, took them home, and researched what they looked like used in homes from pictures online. 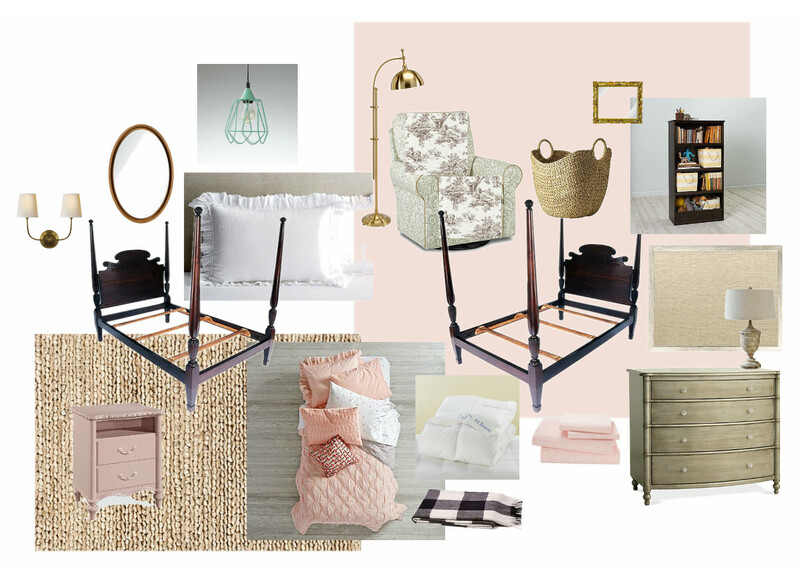 If you didn't already suspect it, I am seriously afraid to commit to color--and I just love the clean look of a neutral colored space with smaller pops of color. For some reason too much color becomes too busy for me. Above is a collage of most of my paint colors for the new house--it's a bit deceiving because our furnishings we already have will add color and make a big difference in the overall look of the space. 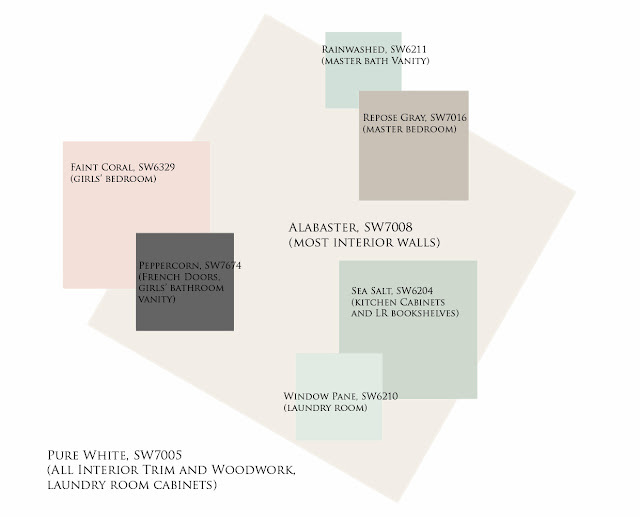 I ended up going with Sherwin William's "Pure White" and "Alabaster" for the interior trim and walls, respectively. I think they nice true whites--the Alabaster is a softer, creamier white and I liked that they didn't present too cool or too warm for what I was going for. It looks like a lot of blue-greens in our house too but in reality we are only using these in small amounts--for cabinetry mostly and for the laundry room. Likewise, the pink, Sherwin Williams "Faint Coral," will only be for the girls' bedroom. 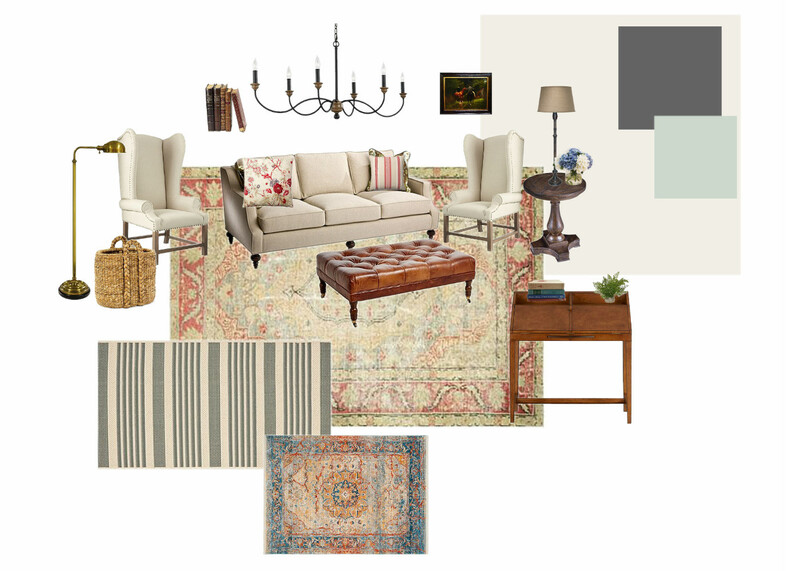 Below are some design boards I created using Olioboard (I love this online tool!) 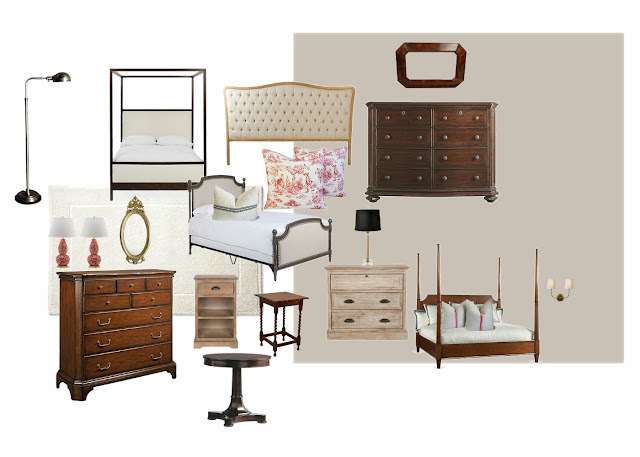 to envision what our furnishings might look like with the paint colors selected for a few of the rooms in our new house. 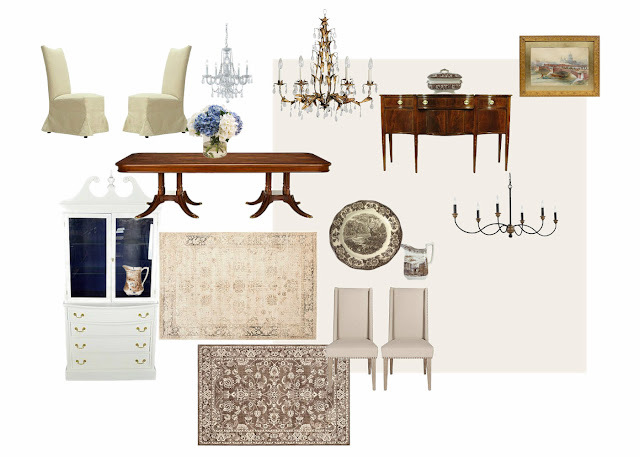 Most of the items I chose for the boards are representative or inspirational rather than actual furnishings we have or plan to use. My overall thought is that we will start with white (and neutrals) and as time goes on if we want, we will slowly move into more color as we live in the space. After all, it's just paint!! And easily changed.